As the 1920s progressed towards their end, the free world?s economies were booming and along with that the motor industry. Buick had etched out its own particular niche as a car of quality, as well built as a Cadillac or Packard, but with a more affordable price tag. This quality of course came at a price and Buicks became more and more expensive as the decade progressed, but with every expanding economies there was more money available to buy them. However by the advent of the 1929 model year things had deteriorated due in no small part to the body design of the 1929 models. Noted designer Gordon Buhrig had had a hand in the design of these cars, but claimed that Fisher Body had altered his design substantially and it had become known as ?The Pregnant Buick?. Buick had decided to go the way of the “companion car” to broaden its model range, a late move in General Motors terms, Oakland marketed the Pontiac for the 1926 model year, Cadillac the La Salle for the 1927 model year. 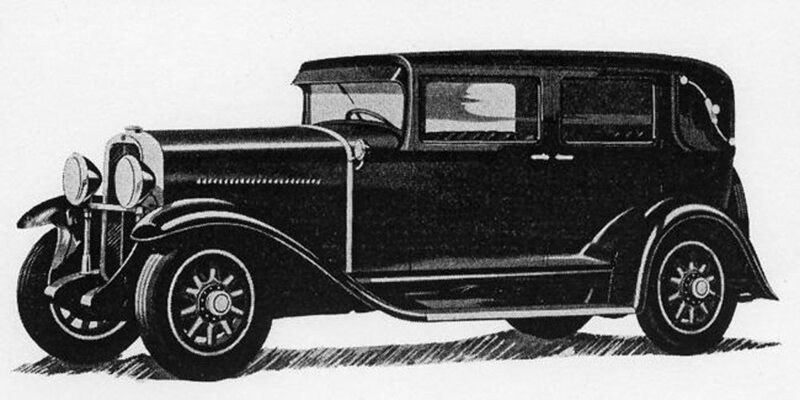 Oldsmobile also marketed a companion car, the Viking, released in April 1929. It was unusual in as much as it was priced well above normal Oldsmobile models and was powered by a V8 engine. 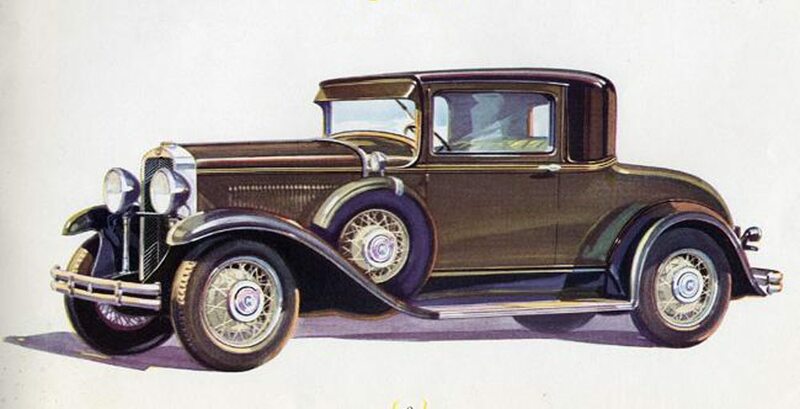 Companion cars were well established across the industry, for example Hudson?s companion car was the Essex, later to become the Terraplane, Reo’s companion the Wolverine, Studebaker, the Erskine and later the Rochne. With the exception of Pontiac all these companions would disappear by 1940. Pontiac was the only real success as the Oakland was dropped in January 1932. 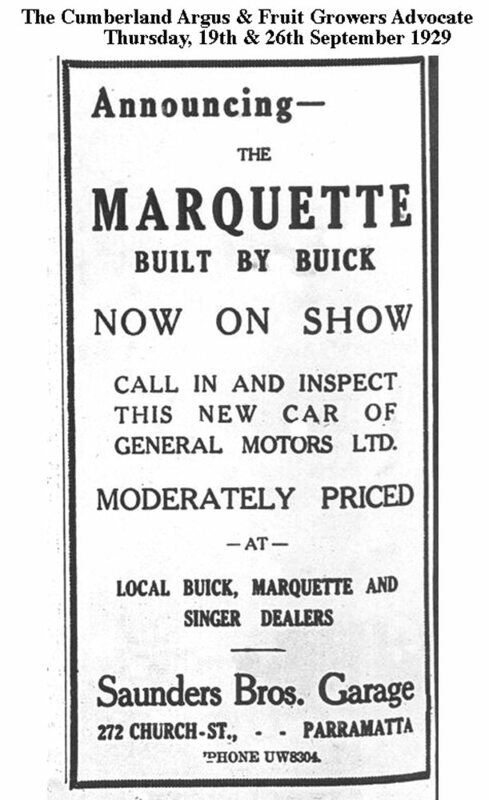 The Marquette was a complete departure from normal Buick practice of the era, released prematurely in April 1929, it had been planned to be a 1930 model. Mechanically it featured a side valve six cylinder engine, which was very similar in design to the Oldsmobile unit, it had a single plate clutch, open tail shaft and semi floating rear axle. 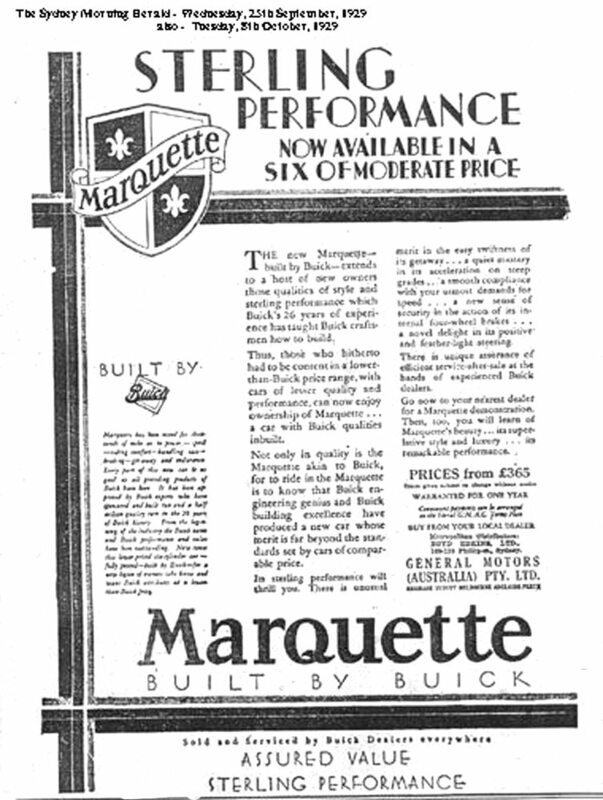 The Marquette was much lighter and more fuel efficient than the Buick, but the car was not a commercial success. In “Buick the Complete Story” Gustin & Dunham put much of the blame for this on the Buick dealers, who felt that the car had much more in common with Oldsmobile than Buick and therefore had little enthusiasm for the vehicle. 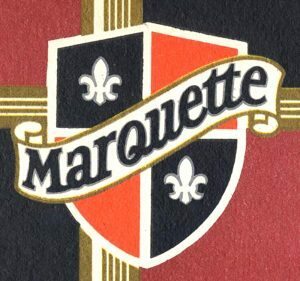 The Stock Market crash of September 1929, which triggered the Great Depression was also a factor, but whatever the reason only 35,007 Marquette’s were built, of this number 1404 were built in other parts of the world on chassis exported from the U.S.A. Automobile Trade Journal & Motor Age of June 1929 featured the Marquette, describing it “In appearance as well as design, there is nothing which can be described as radical.” It goes on to describe the full mechanical details of the car including the “Bendix” internal expanding brakes, which would also be introduced on the 1930 Buicks, some months later than the Marquette. The article quotes performance figures obtained at the General Motors Proving Ground showing a top speed of 65 m.p.h. acceleration from 10m.ph. to 25m.p.h. in 6.3 seconds and from 10 to 60m.ph in 31 seconds. Fuel consumption of 18.4 m.p.g (US Gallons) at 30 mph. In the USA there were five body styles (six models) , the Model 37, Five passenger 4 door sedan, Model 30, Five passenger 2 door sedan, Model 36, Two passenger Business Coupe, Model 36S Four passenger Special Coupe, Model 34, Four passenger Sports Roadster, Model 35 Five passenger Phaeton. Production in the USA continued into the 1930 calendar year, but the car was too slow selling for Buick to continue in the very crowded section of a rapidly declining market and for 1931 there would be an all straight eight, overhead valve range and no more Marquette’s. The same magazine announced the Marquette, complete with a photo of the Coupe on 7th September 1929 quoting the model range will consist of; tourer, sports roadster, sports coupe, four door sedan, touring sedan and Majestic sedan. 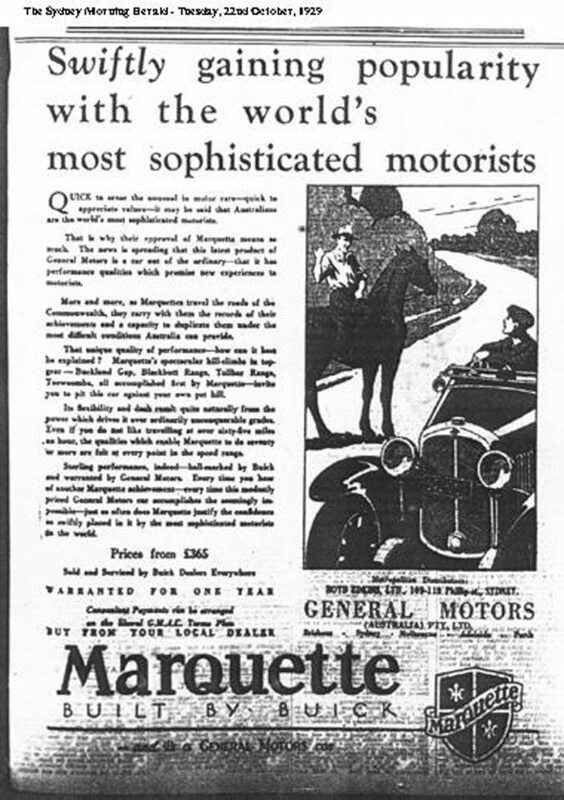 The Australian Motorist magazine described the Marquette in the 1st October 1929 edition under the banner “New Buick-Built Car Combines Fine Car Features and Unusual Performance in the Low Price Field.” The article goes on to fully describe car and quotes the following performance figures using a Majestic sedan laden with 450lbs. Acceleration from 5 to 25mph, 8.8 seconds, 10-25mph, 6.3 seconds, 10-40mph. 13.4 seconds, 10-60mph. 31 seconds. The article also advises that the models available were: tourer, sports roadster, coupe, sports coupe, four door sedan, touring sedan, Majestic sedan. The only Australian production figure available to this writer indicate that Holden Motor Body Builders produced 465 Marquette Sedans and 303 Tourers, all in 1929. This probably indicates that the roadsters and coupes that were sold here, were fully imported. Motor Life magazine of 5th March 1930 ran the following article in the “letters to the editor” column. 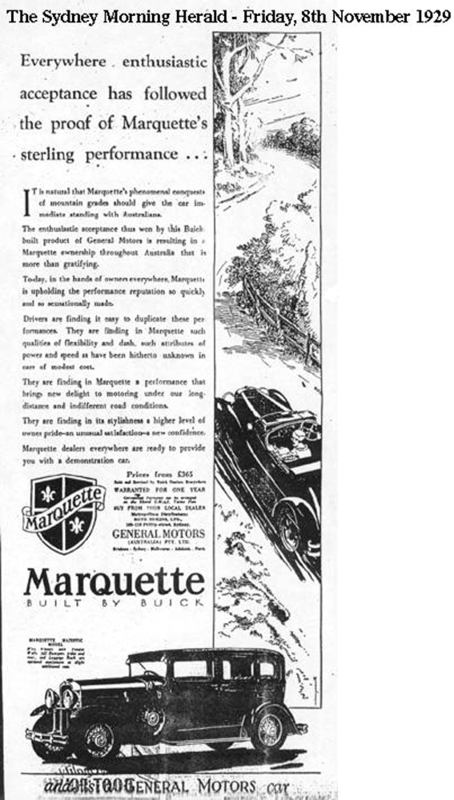 Mr. A. W. Taylor, managing director of Alvin Taylor Limited, recently made an extensive overland trip in his Marquette sedan. The distance covered amounted to 4,800 miles, during which no mechanical service was needed and only one pint of oil was required. So ends the story of Buick’s only companion car, it was not a success for Buick, but they are favourites to those who own and lovingly restore and maintain them.